Affordable drones with great cameras have made aerial photography a reality to amateur and professional photographers, but many don’t realise there are strict laws governing both amateur and professional use. Flying your drone too high or too far can be very dangerous, not only to people or property on the ground but to other aircraft – even a small drone hitting the tail rotor of a helicopter could be catastrophic and potentially result in a fatal crash. Just because we live in Shetland doesn’t mean we’re immune to the rules relating to drones. Our airspace here is surprisingly busy with many low-level flights, intense helicopter activity, numerous small airfields and two busy airports at Sumburgh and Scatsta. Your drone is a fantastic camera in the sky, but learn the rules to ensure you fly it safely. To make our airspace safer make sure you follow the Drone Code every time you fly. 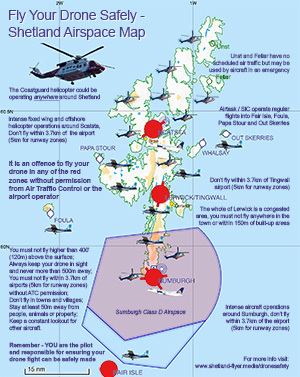 You should also join the Shetland Flight Information Notification Scheme, a local group where you can inform other airspace users where you intend to fly to avoid conflict. Breaking these rules is not only highly dangerous but can result in hefty fines, imprisonment, or both, along with a criminal record, confiscation of your drone (and associated equipment such as PCs and tablets), and possibly a ban from flying drones in the future. There have been several cases in the UK recently where recreational drone users have been arrested and charged with offences under the Air Navigation Order using photos and videos posted to social media sites such as Facebook and YouTube as evidence. Ignorance of the law is no excuse, so learn the rules and fly your drone safely and responsibly. Never endanger people or property by flying near or over them; the propellers of even a small drone can cause serious injury. And never endanger other aircraft; flying too high, too far, or near airports is a recipe for conflict, with serious and potentially deadly consequences. Enjoy using your drone responsibly. Don’t put other lives at risk by flying recklessly or irresponsibly. Remember, you are the pilot and responsibility for the flight lies with you. 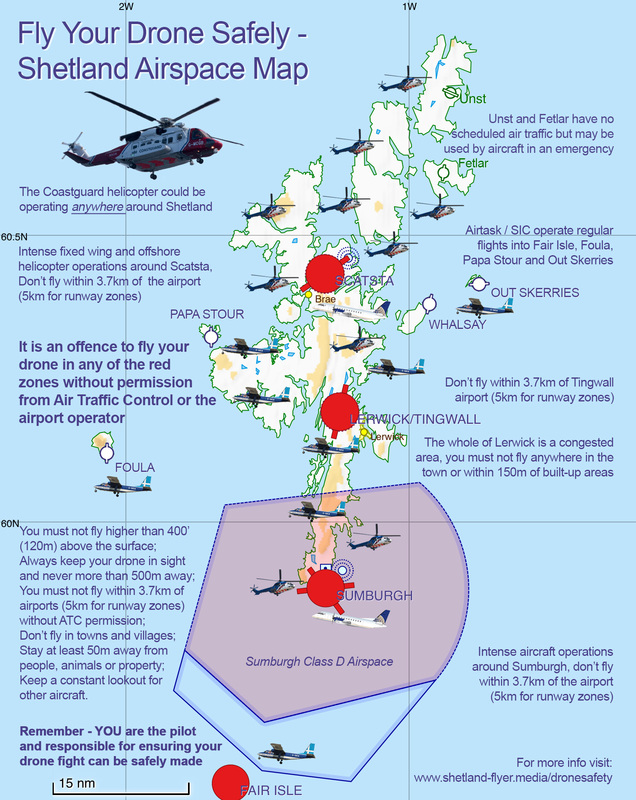 Know the rules, read the Drone Code, join the Shetland Flight Information Notification Scheme and fly safely! This website has been produced by Shetland Flyer Aerial Media to increase safety and awareness for drone operators in Shetland. If you have any questions or suggestions please contact dronesafety@shetland-flyer.co.uk. We're approved by the UK Civil Aviation Authority to conduct commercial operations with small unmanned aircraft up to 20kg in congested areas. We are members of ARPAS-UK, the UK trade association for unmanned aircraft operators, and Drone Safe Register, a verified commercial operator register. Click on the icons below to visit the respective websites.